What Do You Really Need to Learn in College? William D. Coplin, Syracuse professor and author of more than 110 books and articles, discusses how students can use their college academic and non-academic experiences to prepare for a rewarding career. Today, we offer readers some valuable insight from professor William D. Coplin, the director of the undergraduate public affairs program at the Maxwell School of Citizenship and Public Affairs at Syracuse University. A Meredith Professor for Teaching Excellence recipient, Professor Coplin is also the founder of the Do Good Society and the Chairman of Board for the John Dau Sudan Foundation. Professor Coplin is a strong proponent of reforming “both high school and college education to better meet the needs for the majority of students who see education as a path to better employment opportunities.” The 2000-2001 College of Arts and Sciences Award for Outstanding Faculty Advisor also is a strong proponent of internships as well as the other non-academic lessons that college can offer students. Can you give us a brief overview of your philosophy regarding college studies? A college and a dollar will get you four quarters. A college education is four years of experience and not 120 credits. So, are you a proponent of a general liberal arts education? Or do you think colleges should offer a more career-focused job preparation approach? Students should get what they pay for and most want to improve their chances of finding and succeeding in a rewarding career. A general liberal arts education should provide the basic skills and experiences students need to find themselves on a good career path. However, most of the formal academic requirements are aimed at creating professional scholars. In that way, liberal arts colleges are actually more vocational and narrower than most professional schools. The argument that liberal arts creates well-rounded, educated citizens is a cop-out for two reasons. First, 85% of the students are not looking for that in college. Second, the highly fragmented and theoretical nature of liberal arts courses today do not provide a broad based educational but just intellectual chaos. So I think the concept of a general education would be a good one if it were focused more on skills than on learning some body of stuff which no one agrees on. My understanding is that you are a strong proponent of internships. Can you talk a little bit about why you value this concept so highly? The real world is the best teacher. Any kind of fieldwork is the key to developing the skills and exploring careers that will lead students to the next step after college graduation. Internships will help students decide what careers they want to pursue and will hold them to a higher and more difficult standard than college coursework. Moreover, many internships lead directly to a great job with the organization providing the internship. Even if it does not lead directly to a job, it provides a network for a job search. By September 2009, two of my seniors had a $45K+ job starting in June 2010 with a major financial institution where they had done internships the previous summer, and we all know what kind of job market there was at that time. Your book, 25 Ways to Make College Pay Off, focuses on “Advice for Anxious Parents from a Professor Who’s Seen It All.” My understanding is that the book seeks to provide advice on how to maximize the college experience for both future financial and emotional success. Can you give us a brief overview of some of the steps students should be taking while in school to ensure future financial success? The book tells parents what they should do to help their students get the skills employers want and explore careers while completing degree requirements. The most important thing for parents is to treat their children as they would treat an investment in a business. Among other things, it means not doing their college application for them or writing their papers which parents do all the time and making their children pay at least 20% of their education. Work ethic, personal responsibility and a focus on skills and career exploration will help to ensure success. Parents can contribute to their success by keeping their distance or contribute to their failure by not practicing tough love. What are some of the critical elements students should focus on to ensure future emotional success? I have two simple little charts I tell students to fill out to decide what kind of career they might want to pursue. The first gets at the three areas of work activities. Most jobs are some combination of the three. The second chart helps students think about quality of life consideration. Students should put an x where they would like to be on each dimension and then use it as a guide and look for consistency. Place an “x’ on the line which indicates where you want to be when you are 30. 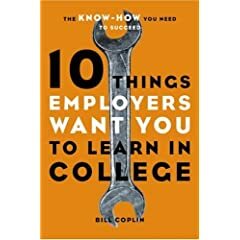 What research process did you use (and which companies did you contact) to determine the list that makes up the 10 Things Employers Want You to Learn in College? Most of it is based on my experience with students when I give them assignments in many of my hands-on courses. In addition, there are many lists around. The one most instructive was developed by the National Association of Colleges and Employers (NACE) which is referred to in the book. I also work with career services on campus and talk with many employers, some of whom are my alumni. I developed a major at Syracuse built around the skills, and my students are very successful in obtaining employment initially and go on to have successful careers. The Public Affairs Program website has testimonials from them that support the view that general skills are the key. Reviewers have said of the book, it “teaches you to solve complex problems, influence people, and detect BS—real-world know-how your textbooks don’t teach you.” Can you briefly talk about the real-world know-how that forms the basis of the book that is often not part of the college curriculum? The vast majority of degree programs in almost all fields in college are top heavy with theory and textbook learning. Theories are just the opinions of scholars that may or may not have application. Having students do community service or a research program for a community agency or participating in a summer internship gives them practice in the skills that are essential like solving complex problems, influencing people and detecting BS. They can develop their own theories, informed but not determined by what they learned in the classroom. The range of activities students can undertake in college to get these experiences is unlimited. Some like coop programs generate academic credit but most do not. Students can learn a great deal by being a Resident Advisor, President of a Sorority, telemarketer for the alumni fund of the college, research or teaching assistant or managing a snack bar. In these positions, they will learn all about problem-solving and working with people as well as detecting BS. Can you give us a bit of an explanation as to what you mean by “detecting BS”? College is a great place to develop the ability to detect BS because there is plenty of it around ranging from what you friends tell you to what glossy college and program brochures tell you. To detect BS, students need to assess what people say for accuracy. They can do this by checking factual statements through research. Did the person present the facts selectively, omitting all basic information? Students should always ask what the purpose of the writer or person making a statement is. Is it to convince or to sell you on something they want you to do or believe? Or is it offered as information through which listeners can reach their own conclusions? Finally, does what an individual say or write correspond with what they actually do? This is especially important in looking for a job because employers might not be completely honest. It is also important on a job where supervisors and co-workers may be trying to get you to do something they want you to do but you may think is not a good idea. You may not challenge them but you should know it is BS and act strategically. Some of the listed items are extremely clear from the titles of each section of the book: the concept of work ethic, speaking and writing well, and the ability to think critically and problem solve. But please talk about three others you note as important: teamwork, influencing people and number-crunching. How do students go about gaining these critical skills? Teamwork – More and more classes have teamwork components. Students tend to avoid these because “they hate working in teams; they would rather do it themselves.” However, they should bite the bullet and take those classes. In addition, they will learn teamwork in most jobs whether it is serving food or fund-raising for a charity. Influencing People – What I said about teamwork goes for this also. Most students and college graduates will tell you getting along with roommates was a very big challenge. That experience will have much more impact than taking Introductory Psychology on their people skills. I also am a big advocate of Dale Carnegie. I make students practice the principles in his book, How to Win Friends and Influence People and give speeches demonstrating how a principle worked for them. You would be surprised how many students learn to avoid arguments with their roommates and convince the police not to give them a ticket by applying the principles. Number-crunching – All students should learn Excel and make tables and graphs using Excel. Almost every internship and job requires it. Taking a course may work but in my experience unless there are practical applications the students will not be very good at it. Continuous practice of Excel and using percentages and statistics are crucial. I usually have students do a cash-flow projection using Excel based on what will happen when they graduate from college. Taking a statistics course offered by Mathematicians will usually be useful; taking a course in which students have to collect and present data to outside clients will always be useful in developing number-crunching skills. Today’s job market is the toughest in recent memory and will continue to be as such for the next couple of years at least. What additional advice would you give current juniors and seniors that you think would most help position them to be one of the lucky ones to secure employment at graduation? Minimize debt because the larger the debt, the less choice you have in finding a job. Graduate as early as you can because the faster you get into the real world, the faster you will be on a career track. Don’t go to graduate school unless you have job experience first. If you run into a dead end, take a job offered by a staffing or temp agency – it will lead to a full time job if you have the skills. Understand that all starting jobs are not a lot of fun. Finally, don’t turn your nose up at sales jobs -everyone eventually becomes a salesperson and it is a way to get ahead quickly if you pick the right company.